Novelis converts aluminium into products for beverage, automobile and construction companies, among others. In the September quarter, its adjusted earnings before interest, taxes, depreciation and amortization (Ebitda) rose to $200 million (Rs942 crore) from $124 million in the previous quarter and $89 million in the year-ago period. The improvement has come partly due to cost savings extracted by the company and partly due to an improvement in volumes (up 4% sequentially). The company estimates that it is currently saving about $100 million in costs, on an annualized basis, and expects the number to jump by about 40% in a year’s time. It has also hiked conversion prices charged to customers for new contracts. 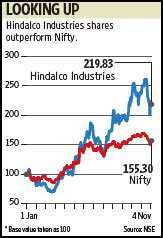 Hindalco’s performance was affected in the September quarter owing to lower commodity prices. Sales were down by 13.5% to Rs4,917 crore and its net profit was down by 52% to Rs344 crore, compared with a year ago. Novelis, in comparison, turned in revenue of Rs10,000 crore, down by 26%, and a net profit of Rs984 crore, compared with a loss of Rs478 crore. A sustained improvement in the financials of Novelis will provide Hindalco shares much support. Since Hindalco expects its aluminium and copper business to face short-term challenges, any help it gets from Novelis will be welcome.